Areas Served: Chicago South Suburbs Tinley Park, Orland Park, Homer Glen, Flossmoor, Frankfort, Homewood, Lockport, Lemont, Mokena, New Lenox, Palos Heights, Palos Hills, Palos Park, including the entire Chicago South Suburbs and the Chicagoland area. 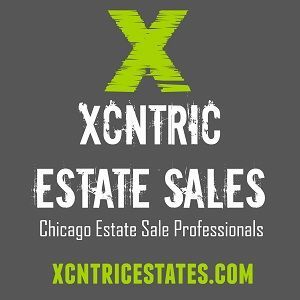 Enter your information in the form below and we will notify XCNTRIC Estate Sales that they can contact you about your inquiry. "We were MOST pleased with everything that you did for us. There is no way we could have done it ourselves. We have the highest regard for Kim and Claire. Not only did they organize, price and stage our sale in a most professional manner, we had the utmost confidence in their ability to manage the sale with no interference from us. At the end, everything was left in perfect order and we were most pleased with the results." Don & Jeanne S.
"This was our first experience with an estate sale. We made a few calls from the phone numbers we gathered then arranged an interview. The girls showed up, made a quick evaluation then walked us thruogh the process. We gave them the green light and set a date. About 10 days prior they came in and went to work. The estate and it's contents had been neglected for a time and everything needed a good cleaning. I would stop in on a daily basis in the evening, after their work hours, and was amazed at their progress. Everything was cleaned, catagorized and priced. The sale was a success, actually more successful than I anticipated. If I needed to do it again Xcntric would be my choice." John M.
Barbara B - Mokena, IL November 17 at 10:41am This company did a great job for us! Very happy to recommend to anyone! George S. Jr. Tinley Park - Dec 23, 2015 "I believe that there is a "HUMAN SIDE" to business. Even though Xcntric Estate Sales had a job to do, it never felt like anything other than friends HELPING me regain traction in life!! Kim & Claire bring an ease to a situation that could have easily been overwhelming; yet it wasn't. I made the right decision when I called their company."